Southsea Waverley are closing in on retaining their Portsmouth & District League division one title after a 43-shot win at Leigh Park. The defending champions triumphed on all four rinks – led by the 16-shot success on Matt Marchant’s rink. Second-placed Priory fell to a surprise nine-shot defeat at home to Rowner. They only managed two points from the match, courtesy of Adrian Snook’s rink. A well-deserved win for Rowner was led by Barry Stafford’s quartet. That result was in stark contrast to their game the night before – when they suffered a 38-shot home defeat at the hands of Fareham. The Leigh Road squad won all four rinks, led by Allan Leppard’s men. However, Fareham failed to follow that win up as they fell to a 25-shot defeat at Vospers, whose four-rink triumph was inspired by Barry Robinson’s quartet. Lee-on-the-Solent took advantage of Priory’s defeat to leapfrog them into second place. They did so with a 28-shot win at Bedhampton as Martin Ellis’ men hit top form. In the division’s other game, Alexandra recorded a 17-shot victory at home to Waterlooville. With both sides winning on two rinks, the margins of Alex’s successes proved crucial. In division three, refreshed from their week off, leaders College Park travelled to bottom club Emsworth and left with a handsome 39-shot victory. The win extended their advantage over Bridgemary to 39 points. College won on three rinks, with Alan Lewis’ quartet leading the way. Bridgemary had a battle with Gas Social before edging them by two shots at their Cunningham Drive home. 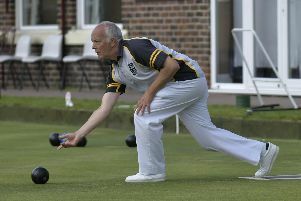 With both clubs winning on two rinks, it was the 13-shot win by Peter Cooper’s quartet that swung the match the Gosport club’s way. Elsewhere, Pembroke Gardens moved above Cosham Park into third thanks to an 18-shot home win. Dave Brooke’s quartet starred for the triumphant Gardens.